Google+ biggest move which grabbed most of the attention this week was obviously the implementation of Google Places into the social network as Google+ Local. However, there are some more smaller but yet interesting additions and features’ testing noticed in the last few days. Let’s begin with what has been officially released first. Google’s Accessibility team engineer, James deBoer, posted on his Google+ account that it is now possible to add captions from subtitles files into the user’s uploaded videos directly from the Google+ video post. In order to insert a caption into a video, the user needs to open the video post (from the Videos tab for instance), click on the “Options” menu at the bottom of the post and choose the “Closed captions” button. Click on the “Add new captions or transcript”, choose the subtitle file from your computer, its language and click on “Upload”. Note that there are few limitations to the feature: The subtitle files have to be in the .SUB or .SRT formats, they can’t exceed the 2MB size and the caption track can’t be longer than the video itself. It is possible to add multiple subtitles of different languages (one file for each language). This is actually quite a great addition for people or businesses which engage with video uploading. Subtitles are an excellent way to expand the reach of a video beyond one specific language that many people might not understand. In fact, it can also even contribute to people that do speak and understand the video language (I personally love subtitles in any video). Another mysterious new feature which will arrive soon and apparently it’s in testing at the moment is “Events”. The Verge already discovered about a week ago two lines of codes inside Google+ app which contains the words “Events” and “Local” (which already launched). But now, there are also some screenshots wandering around the web (you can watch one of them below). 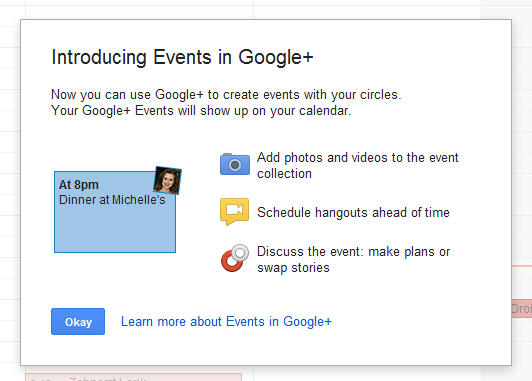 As it appears, the new Events feature will integrate with Google’s calendar service, it could be shared with the user’s Circles, discussed and to add photos and videos to the “event collection”.